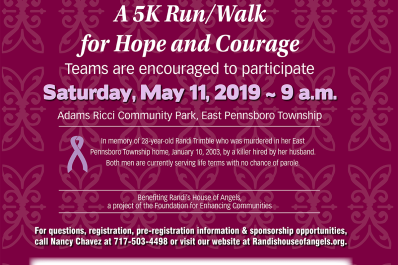 Randi’s Race for Hope and Courage is a 5K Run/Walk in memory of Nancy Chavez’s beloved daughter, Randi Lee Trimble. Randi who was murdered in East Pennsboro Township on January 10, 2003 by a hit man hired by her husband. Both men are now serving life terms with no chance of parole. Since her daughter’s death, Nancy has been an advocate for victims of domestic violence. In 2011, she established Randi’s House of Angels (RHOA), a project of The Foundation for Enhancing Communities, fiscal sponsor, that supports children who experience and/are victims of domestic violence. Over the past fourteen years, Randi’s Race has raised more than $423,000 to benefit Randi’s House of Angels. Over $275,000 has been donated to domestic violence and crime victim agencies that support programs and services for children. More importantly, Randi’s House of Angels maintains therapeutic programs, including Randi’s Kidz Club, a twelve-week therapeutic group for children; Randi’s Camp, a three-day interactive summer camp, and NEW in 2019: Randi’s Klubhouse, for children ages 5-7. To date, more than 100 children have received services through RHOA. 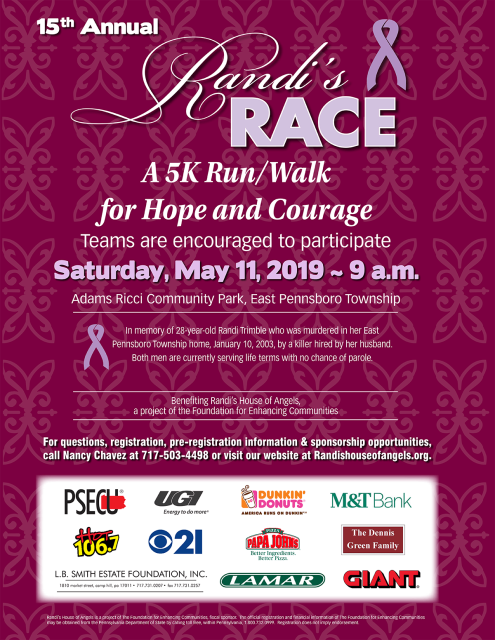 Randi’s Race is a community event that creates awareness and advocates against domestic violence. You can make a difference. Bring your family, friends, and colleagues and enjoy the fun activities for all. Checks should be made payable to The Foundation for Enhancing Communities (TFEC). Please write Randi’s Race 2019 on the memo line. You can also mail your donation directly to TFEC, write “Randi’s Race 2019” on the memo line and mail to 200 North 3rd Street, 8th Floor, Harrisburg, PA 17101. Donations will be accepted up to June 30, 2019. • Papa John’s Selfie Contest – Post a selfie to @PapaJohnsPizzaPA social media page and enter to win 1 FREE PIZZA every week for the remainder of 2019.